Kabuki is one of the representative compositive arts in Japan accompanying the elements of theater, dance and music succeeded to nowadays. The each character of the word 'Kabuki' represents music, dance and act. The word Kabuki is said that it came from 'Kabuku'. The strange act and dress were called Kabuki and the these man were called Kabuki-mono. The origin of Kabuki is said to be Izumono Okuni who gave a performance at Kitanotemmangu, Kyoto in 1603. Okuni danced with the popular song of the time and she adopted the act of Kabuki-mono wearing men's clothes. Then she created cutting-edge entertainment. After Okuni became famous, many imitator appeared. Yujok-kabuki by prostitutes and Wakashu-kabuki by the boys were performed. But they were forbidden because it was considered to corrupt public moral and Yaro-kabuki (Kabuki by men) which is succeeded to nowadays. So still now, Kabuki is performed only by men even the role of the female (right photo). Kabuki is devided into 'Kabuki Odori (dance)' and 'Kabuki Geki (drama)' by the process of development. Kabuki Odori lasted until the time of Wakashu-kabuki, which indicates the dance with the popular songs. Kabuki Geki has become the drama withe de element of dance after produced for the common people in Edo era. The forbiddance of Wakashu-kabuki and the order by the feudal government to play 'impersonation and Kyogen' also encouraged the development of Kabuki as a drama. The government thought the dance performance corrupt public moral. The contents of drama came from the historical facts, stories and affairs and started to be called 'Kabuki Kyogen'. This is not only like a movie and TV drama of nowadays, but also entertainment like a variety show to satisfy the curiosity by sense of vision and hearing. Until the mid Ed era, together with the influence of Ningyo Joruri (puppet show) most of Kabuki Kyogen was written in Osaka. From late Edo era to early Meiji era, Mokuami Kawatake created a lot of pieces and the position of Edo as cultural center had raised. These Kabuki Kyogen was called 'Shibai (play)'. In Meiji era, by the influence of Western culture, the movement to reconsider the value of Kabuki. Shoyo Tsubouchi created New Kabuki, however it could not gain peoples support and they are seldom played now. After the Second World War, Kabuki was forbidden to play in public by GHQ because they thought it feudalistic and not suitable for democracy. It rivived in 1947. Recently, by the diversification of amusement, Kabuki was in danger of declination, but the layer of fan has widened after the performance of 'Super Kabuki' adopting newest art, fashion, sound and lighting in 1986. There are theaters exclusively for Kabuki because there are various characteristics which don't suit for other plays. This is a path stretching straight from the left side of the stage to the other end through the audience seats. This path changes the role by the scene for example, street, beach and bank of a river. Because it is very near to the seats, it gives the audience sense of intimacy. This is a stage mechanism. Cut stage floor can go up and down like an elevator. There are three types. 'Ozeri' can carry stage constructions. It is used for the dynamic change of the stage. 'Kozeri' carries the actors. 'Suppon' is situated at the bottom of Hanamichi. 'Hanamichi' gives two dimentional image and 'Seri' gives three dimentional image. You cannot see these devices in any other theater. Roundly cut floor in the middle of the stage can be rotated. Two or three different stage constructions can be on Mawaributai and they can change the scene smoothly by rotating it. It also gives you visual effect. It is rotated by the electricty now, but it used to be rotated by the man power. 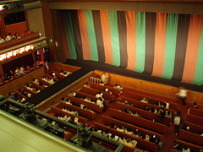 This is a draw curtain of the theater. It is made by stiching the cloth of 3 different colors in stripe design. The colors are black, yellow-green and persimon. This design is a symbol of Kabuki. By using draw curtain, it separates the time. It introduces the flow of the time naturally to the stage and enabled the development of the complicated play. By the role, the actors wear various costumes, wigs and instruments. They make up their face and the most distinguishing feature is Kumadori (right photo). The thick lines exaggerate the veins and muscles of the face. They differ by the role. Unusual act and choreography emphasized on the visual effect. It may deviate from the authentic act and choreography, but it is used when there is an inevitability by the works or the roles and it directly appeals to the sence of the audience directly. 'Hikinuki' is changing the costume in an eye's blink. 'Chunori' is hanging the actor from the ceiling and moving above the stage and audience. 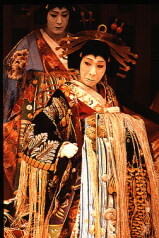 'Nigyoburi' is imitating the puppet by the actor. The actor stops and gives a pose for a moment to express growing sentiment. It gives the actor a closeup effct. In many cases, at the moment of 'Mie', 'Tsuke' wood is beated. By the role, the actor moves his head just before 'Mie', makes a big step or opens his arms for more visual effect. This is a choreography to express the strength and asperity symbolically by exaggerating the movement of the arms and legs when the actor walks or runs. It is played mainly by the 'Aragoto' role (brutal role) when he goes away through Hanamichi. It is roughly divided into song 'Nagauta' and narrative 'Joruri'. It is developed as an accompaniment of kabuki. It is ofen played in the dancing stage and dancing scene. The players are in charge of back ground music in the area called Kuromisu at the side of the stage and play accompaniment and sound effect. They describe various sound, for example water by the dram, sound of the bell of the temple by 'Sho' bell instrument. It is a kind of Joruri. It is played in the program which came from 'Ningyo Joruri' In Ningyo Joruri all the lines and explanation are talked by 'Tayu' (narrator) of Gidayubushi. But in Kabuki, lines are talked by the actor and Tayu only explains the scene. Gidayubushi in Gidayu Kyogen is played on the special stage called 'Yuka'. These are the musics played on the board on the stage other than Kuromisu or Yuka. 'Jidaimono': the story of the past. 'Sewamono': the story of the same period (* same period means Edo era). There is other classivication byt the process of birth of the grogram. 'Gidayu Kyogen': introduced from Joruri. 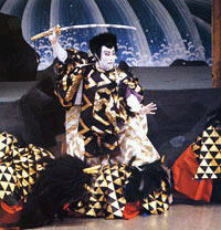 'Jun (pure) Kabuki': witten originally for Kabuki. 'Shin (new) Kabuki': witten not by Kabuki writer but literary persons after mid Meiji era. The scenario derives from the fact and story of the noble and Samurai societies between Heiany and Sengoku era (14-16th century). 'Kanjincho', 'Sugawara Denju Tenarai Kagami' and 'Kanadehon Chusingura' are the representative works. The scenario drives from the fact and story of the everyday life in Edo era. Specially the works to express the the everyday life of the ordinary people with reality is called 'Kizewamono'. 'Sukeroku yukarino Edozakura', 'Sonezaki Shinju' are the representative works. It is dancing performance. It used to be played only by female impersonators, but after late 18th century, male role also plays and 'Henge Buyo' which dancer plays the different roles became popular. 'Renjishi', 'Fujimusume' (right photo) and 'Uiro Uri' are the representative works.